Public meetings give people a chance to explore proposed improvements and express their concerns. Public workshops, held during early phases of the project, give those who are most affected by the project the opportunity to learn about the job and share their views and concerns. Check back to see what meetings have taken place and watch our presentations. 2/9/2017 Public Meeting at Hilton Orlando/Altamonte Springs A public meeting was held from 5 to 8 p.m. on Thursday, Feb. 9, at the Hilton Orlando/Altamonte Springs. The meeting was an informal open house where plans were available for review. A video was also shown. Attendees had the opportunity to see the improvements planned in the Altamonte Springs and Longwood, including improvements at State Road 436, Central Parkway and State Road 434. Download the Roadway Plans and Profiles in PDF format. 9/16/2015 Public Meeting at Wyndham Orlando Resort A public meeting was held on Wednesday, Sept. 16, 5:30 p.m. to 8:30 p.m. at the Wyndham Orlando Resort. The meeting was an informal open house where plans were available for review. A video was also shown. 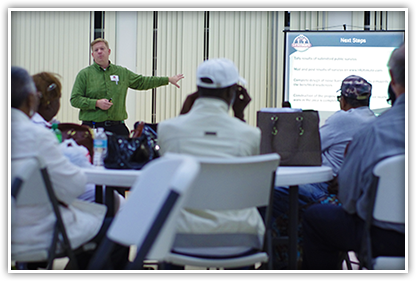 3/14/2015 Orlando City Council Workshop – 3/14/2016 The Orlando City Council Workshop held on March 14, 2016 featured an update on the I-4 Ultimate project. 8/5/2015 Public Meeting at Orlando Science Center A public meeting was held on Wednesday, Aug. 5, 5:30 p.m. to 8:30 p.m. at the Orlando Science Center. The meeting was an informal open house where plans were available for review. A video was also shown. Attendees had the opportunity to see the improvements planned in the Winter Park, College Park and Ivanhoe area, including improvements at Colonial Drive, Ivanhoe Boulevard and Princeton Street. 5/28/2015 Public Meeting at RDV Sportsplex A public meeting was held on Thursday, May 28, 5:00 p.m. to 8:00 p.m. at the RDV Sportsplex. The meeting was an informal open house where plans were available for review. A video was also shown. Attendees had the opportunity to see the improvements planned in the Altamonte Springs, Longwood and Maitland area, including improvements at Maitland Boulevard, State Road 436 and Wymore Road. 3/25/2015 Downtown Orlando Pre-Construction Area Meeting A public meeting was held on March 25, 2105, at the Orange County School Board – Joe Davis Board Room in Orlando, FL. The meeting was an informal open house where plans were available for review. A video was also shown. Attendees had the opportunity to see the improvements planned in the downtown area. 1/20/2015 Eatonville Noise Barrier Public Information Meeting A public meeting was held on January 20, 2015, at the Robert Hungerford Prep High School Cafeteria in Eatonville, FL. The meeting was an open house format with a brief presentation, followed by the opportunity for attendees to ask questions regarding the proposed noise barriers in their community.